The heading character and Script construction. 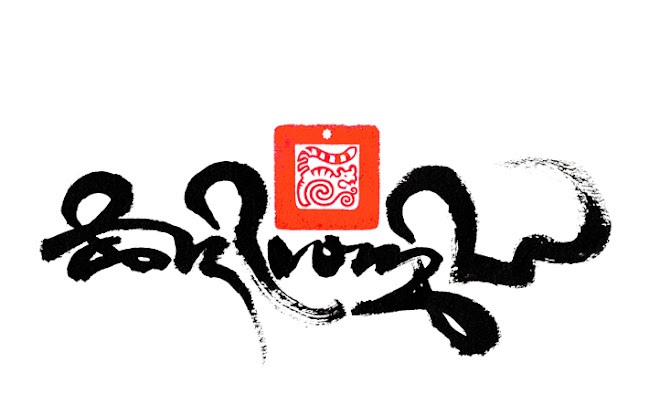 The illustration shows six variations of the Uchen script style 'heading' character. 6, an elaboration using two 'Ha' syllables. 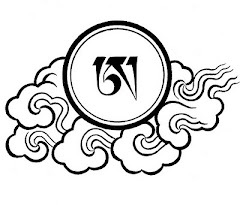 On every beginning of a Tibetan page of text or title is found the characteristic swirl symbol, this is known as the ‘heading’ character, its job is to announce the start of the text it prefixes. It is not a word as such but a symbol, which is as much decorative as functional. As with the letters of the Uchen alphabet, the heading character is constructed using a particular system of proportion. The heading character is commonly scribed as two swirls. This is described as resembling the nose of a snake, whereas a single heading character is described as the horn of a rhinoceros. Less commonly, is a treble heading character, which used at the very start of major text. There are many stylistic variations of the heading character, historically and from the location the script derives. 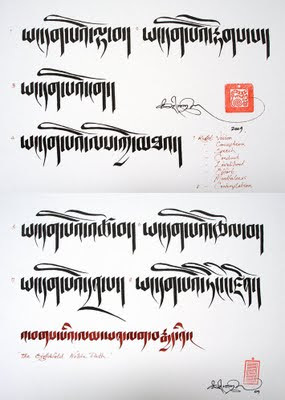 Besides the Uchen script, each of the different Tibetan scripts has its own styled heading character to suit. The heading character in the Uchen script style is finished with a single vertical down stroke, called ‘Shay’ in Tibetan. This is also used as a sentence divider and a stop. At the very end of a large piece of text or important title, there is often a double stop stroke. A different smaller triangular dot is used to separate the words. The correct proportion for writing the Uchen script is to calculate the size of the letters in accordance to the size of the pen nib used. First, horizontal lines are scored on the paper. The distance between the lines is determined by doubling the italic pen nib size to make one part. There is a 3x3 part grid as a guideline for the top portion of the letters and another equal in size for the bottom tails of the longer letters. This is demonstrated in the image above, showing the first four and last three of the Tibetan alphabet letters in relation to the proportion lines. The application of the letters to the score guidelines always starts with the first stroke of the letter across the top, from left to right. This is called the head of the letter. According certain letters, the head may differ from Long to medium to short in length. The construction of a letter then follows with separate down strokes. Each different letter has its own particular order and direction of application. Names are given describing the different strokes, such as shoulder, chest and leg. The object in creating a good Uchen script is to be as straight and neat as possible, all the letters should be hanging from the same straight line, with curved strokes well formed and rounded. Vertical ‘leg’ strokes should be thicker at the top and to a fine point at the bottom end; this is achieved by twisting the italic pen on the down stroke. There should be good contrast between the thick and thin lines throughout the letter. All down strokes should end in the same manner. The scored lines help to achieve this discipline and uniformed appearance. The above image shows the heading and Uchen script at an acute angle to highlight the uniformed alignment of the letter strokes. Here shows an elaborate 'high' version of the Dru-tsa script according to the precise grid guide-line, as with the Uchen script, the size of the grid score lines are determined by the size of the italic pen nib used. 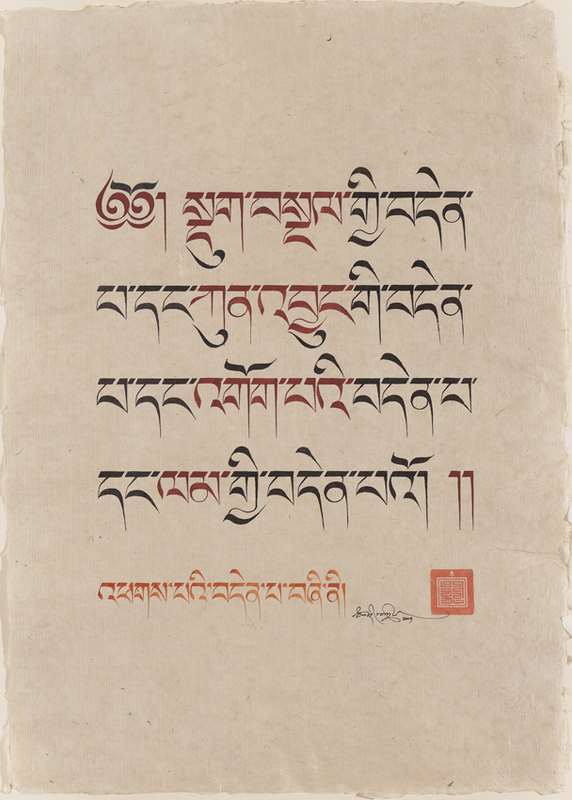 The proportions of the score lines are such to allow the flow and grace, typical of the Dru-tsa calligraphy style. 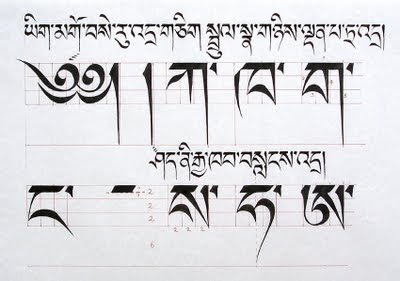 The smaller red Uchen script translates the Dru-tsa script as "the command of the beautiful letter form". An example of a text page in the Uchen script style. 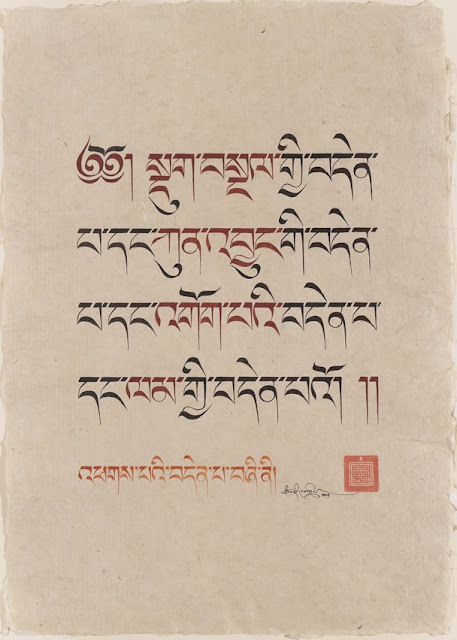 The front side of this well thumbed page is identified buy the heading character, the back side of the text page has no heading character, this has a practical use, considering the pages of a Tibetan text are all loose. For a basic history of the different Tibetan scripts listed and their usage, please visit the Scripts and conservation page. All the above images are created by Tashi Mannox in accordance with the traditional methods of proportion of the Tibetan writing systems. © Tashi Mannox 2009. Also available as a quality limited edition print. representing the turning/teaching of the truth/Dharma. Here depicted seated on an open lotus flower of purity. For a high quality resolution copy of the above Dharma Wheel image and others please follow the link here. 1 - Around the central wheel at North, East, South and West) are small groupings of Three dots which to me represents the Four Noble Truths, as listed below. 2 - Also around the central wheel are four solitary dots NE, SE, SW, NW which to me represent the four sublime states. 3 - The wheel's three basic parts are symbols of the "three trainings" in Buddhist practice (wisdom, discipline and concentration): The hub symbolizes moral discipline, which stabilizes the mind. The eight spokes represent wisdom which is applied to defeat ignorance. The rim represents training in concentration, which holds everything else together. More specifically the 8 spokes represent The Eight Fold Path, as listed below. 4 - Within the hub are three swirling sections (Gankyil) which to me will represent the indivisible essence of the Three Dharma Seals (Three Marks of Existence): Anatta, Dukkha, Anicca. 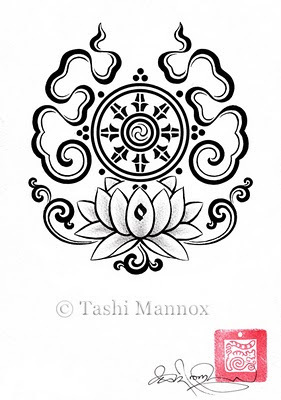 5 - The Lotus is one of the Eight Auspicious Symbols (The Dharma Wheel being one as well) and one of the most poignant representations of Buddhist teaching. Though there are other water plants that bloom above the water, it is only the lotus which, owing to the strength of its stem, regularly rises eight to twelve inches above the surface. White Lotus (Skt. pundarika; Tib. 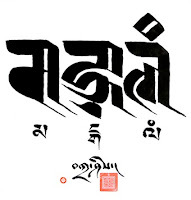 pad ma dkar po): This represents the state of spiritual perfection and total mental purity (bodhi). It is associated with the White Tara and proclaims her perfect nature, a quality which is reinforced by the color of her body. Pink Lotus (Skt. padma; Tib. pad ma dmar po): This the supreme lotus, generally reserved for the highest deity. Thus naturally it is associated with the Great Buddha himself. Red Lotus (Skt. kamala; Tib: pad ma chu skyes): This signifies the original nature and purity of the heart (hrdya). It is the lotus of love, compassion, passion and all other qualities of the heart. It is the flower of Avalokiteshvara, the bodhisattva of compassion. Blue Lotus (Skt. utpala; Tib. ut pa la): This is a symbol of the victory of the spirit over the senses, and signifies the wisdom of knowledge. Not surprisingly, it is the preferred flower of Manjushri, the bodhisattva of wisdom. 6 - The scrolling coming from the lotus does not have any symbolism as far as I can find but to me will represent The Three Gems: Buddha, Dharma, Sangha. 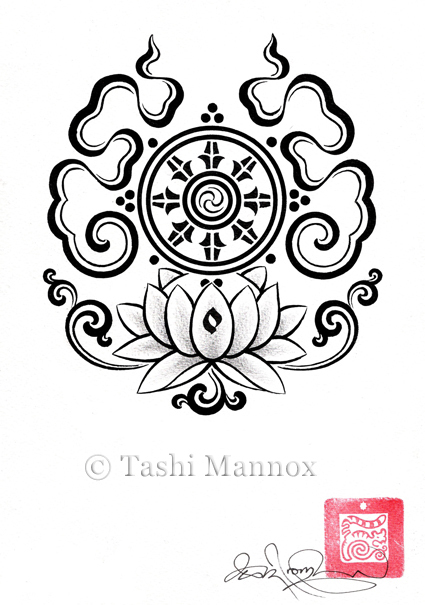 7 - The front 5 petals of the lotus to me will represent the 5 Precepts. 8 - the symbol of a flame upon the lotus represents Nirvana. 9 - The Smokey Mist like clouds which is emanating from the lotus flower from all directions and enveloping the dharma wheel represents the sweet fragrance of the dharma. The Eightfold path listed here in the Tsugtung script style.